In his second year, Joshua Tully of Daisetta upped his game by doing the longer 30-mile ride. He found a friend, Rick Chandler of Humble, who partnered up with him and kept an eye on him throughout the ride. A little rain, no problem. His rain coat was neatly packed away in his backpack. “Not even wet,” Nestor Barroeta of Lumberton proclaimed as he held out the slicker. The rest of him was soaked, but he didn’t even care. “I did the ride the first year and it was fun.” He skipped last year because he feared the inclement weather but decided not to let it bother him this year. “It’s a pretty ride out here,” he said. 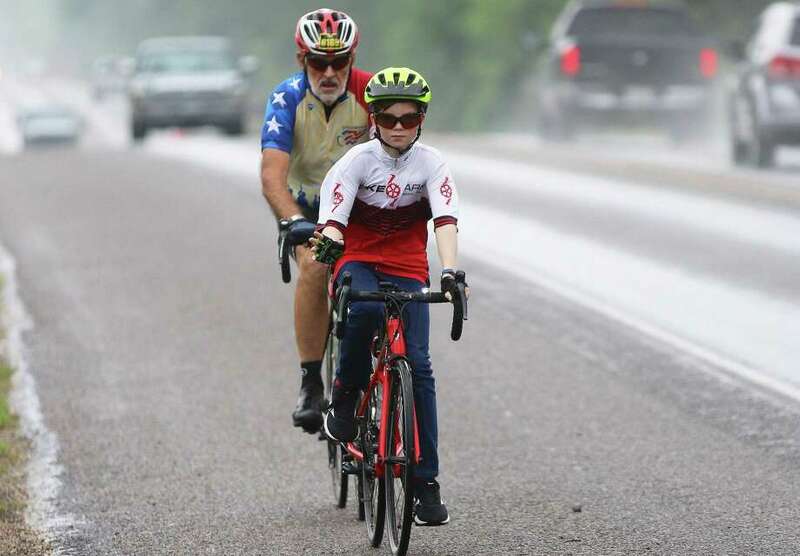 Nearly 60 riders braved the wicked weather Saturday to enjoy the Fourth Annual Liberty Freedom Ride, a fundraiser for the Liberty ISD Education Foundation. Despite the threat of tornadoes and hailstones, the riders hit the courses (five of them) and only endured sporadic bursts of rain—nothing major. “We told them before we started that it was going to be a wet day and just to relax, have some fun, take their time and be careful going too far north,” said Foundation Coordinator Bruce Wright. Wright said they waited late to make the call on whether to cancel the event until they had good intel on the weather conditions. “If it was threatening, we weren’t going to put people’s lives in danger, which is why we waited until the last minute,” he said. They had 58 actual riders, but registered close to 80, considerably smaller than previous years but not unexpected with the weather concerns. The last two years have put a dent in the organization’s ability to raise funds for the scholarship because of the weather. Last year Mother Nature was a major factor in the first of two years of a downturn from their record year in 2017 where close to 200 riders flooded the courses. “We’ll have to do some work to get those back that we had in 2017,” he said. The registration process may need some tweaking, Wright considered. “Typically, cyclists have it easy to sign up online right before the race. That means they can watch the weather and then decide not to do the race,” making it difficult for organizers to make a call on the event’s ability to go on. The drop in riders participating affects the bottom line. “It’s our grant program that we’re funding. We have a great group of sponsors that help us cover the big costs and the fees are money made on top of that,” he explained. Wright said they will look at incentivizing riders to register early with lower fees and maybe higher on the day of the event. The event continues to attract new riders. Jeff Burdick is a board member on the Hamshire-Fannett Education Foundation and decided to come out with a colleague to see how it all works. “We already do a run and I would like to add a biking component to it,” he said. They weren’t worried over the rain. He hoped to return to his board with some suggestions. None of it affected Bill Spikerman leading the Phillips 66 riding team. “This is my niece’s first ride and she’s already been practicing.” They plan on riding in the much larger MS-150 in two weeks and this is a warmup ride for them. “We’ll do the 50-mile ride today,” he said which was a first for them. “Your bottom has to get used to being on that seat for a long time,” he said. Spikerman said it was their first time for the Liberty Freedom and didn’t encounter any problems. There was one moment on the course that had officials scrambling when a biker went down in a nasty crash on the rain-soaked roads. “We were coming down these rollers right here and my friend had a flat. I wasn’t paying attention and got right up on him and all I could do was slide out at that moment,” said Chris Bond of Liberty. “It was totally my fault. The weather wasn’t a big help, but it happens,” he said. Bond is a member of the Liberty-Dayton Bike Club and the veteran rider said he’s been up and down that road dozens of times. “This shouldn’t be a shocker for anyone,” Bond confessed saying he’s fallen before, but not because he had clipped ends with another biker. His day was done following the accident, but he was in good spirits. He did pick up some stitches for the cut on his arm, but otherwise was alright. He was treated on the scene by Dr. Steven Ellerbee who has a family practice at Liberty Medical Surgical Clinic, a sponsor for the race as well. “I’ve provided medical support for the ride since it began,” he said proudly. He’s kept a low profile since joining the team. “If you don’t get hurt, you don’t see me,” he laughed. “We try to take good care of the riders. There’s first aid supplies at each rest stop for minor things, band aids and moleskins for blisters–that sort of thing,” he said. There are ham operators at each rest stop that can reach him when needed. A group of motorcyclists are constantly traversing the course watching for danger or any rider who may need assistance. “We have a good safety net out here and can take good care of them,” the doctor said. “This was the first time I had to get out a dressing. These riders are pretty independent and self-sufficient and take care of themselves,” he said. Saturday, however, was a bit of a different situation with treacherous situations produced by the rain and wind. There were also a few more flats than normal because of the wet weather. Kickstand Bikes and Tailwind Cycles, both mechanical groups, were traversing the courses with tubes to respond as needed. “A lot of the riders carry their own tubes because they know it’s not if but when will they have a flat,” Wright said. The Rotary Club did them a big favor by holding their annual Chili Cookoff at the same time. “They donated the riders their food for free,” Wright said. He was appreciative of the gesture and said it helped them, particularly this year, to extend their ability to help students and teachers with scholarships and grants.